White kitchens are such a classic they’re always in style. Take a look at my latest post from the Huffington Post about the latest trends in white. Storage is one of the most important elements in a kitchen: You want to keep everything handy, but don’t want to actually see it all most of the time. 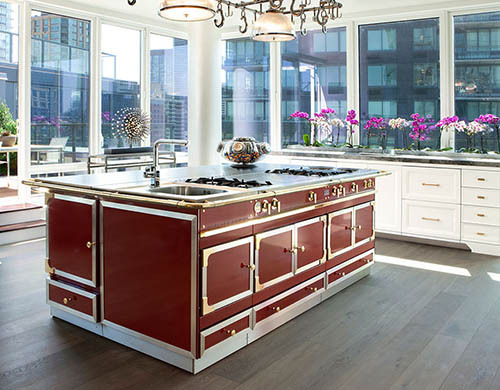 Typically, most kitchen design projects focus on cabinetry, countertops and appliances, while the floors, walls and ceilings often are given short shrift. As a designer, I spend a lot of time thinking about what people see when they walk into a room. Which is why, more often than not, my designs include streamlined, invisible storage solutions. I’m the newest Expert on Caesarstone’s Interior Collective blog, ready to answer YOUR questions about designing a kitchen perfect for entertaining. Just click through the post and ask a question. Cooking is one of my passions, and, for me, it doesn’t get any better than preparing a meal for my closest friends and family. I know that not everyone feels that way — it’s a big job! If you’re using your kitchen as it’s intended you’re going to need some kind of ventilation system which keeps residue off of your surfaces, and smells out of the air.